Swift action by Ducks Unlimited Canada (DUC), with advice from the Ministry of Natural Resources and Forestry and investment from the Invasive Species Centre, ended in a successful removal of an aquatic invasive plant from a landscape feature in southeastern Ontario. For nearly a decade, Karen Lavigne battled a fast-growing aquatic plant which would take over her small pond, year after year. “Every time I would rake it or pull it out, it kept coming back,” she explained. 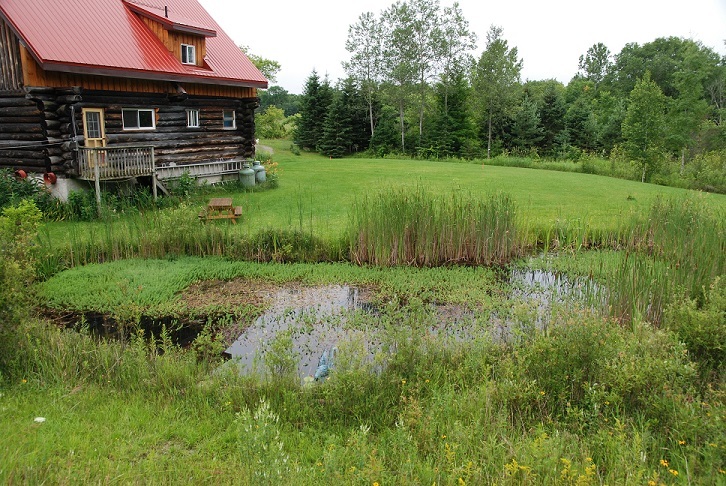 Karen lives near Mallorytown, Ontario, and installed the pond in 2010 as a decorative water feature in her yard. In time, she realized that something was wrong and made the wise choice to contact the Ministry of Environment, Conservation and Parks. “Once I realized that this plant had the potential to negatively affect the waterways around me, I reached out to the Ministry of Environment who suggested I contact Ducks Unlimited Canada,” she explained. DUC is a national leader in wetland conservation and increasingly applies its resources to address invasive species in wetlands and other aquatic habitats. Kyle Borrowman, conservation specialist with DUC, took samples of the aquatic plant in the pond for identification by the Ministry of Natural Resources and Forestry. Swift action was important to stop its proliferation in southeastern Ontario, which contains some of the province’s most important wetlands. Kyle consulted on the best course of action with DUC’s invasive species control staff in British Columbia, where the green, fern-like perennial is a bigger problem, and determined that the small pond could not be “cleaned” of the plant. Karen’s water feature was removed, and the plant and its roots were secured to protect the area’s naturally occurring wetlands, streams and rivers. “Karen is a great example of somebody who was willing to do the right thing to protect our ecosystems and we were happy to work with her,” said Kyle. Parrotfeather is rare in Ontario. The plant is native to South America, but it can overwinter in many parts of Ontario. Until recently, the attractive plant was available for purchase through aquarium and water-garden suppliers. The problem is that parrotfeather, also known as Brazilian watermilfoil, grows in dense mats that can reduce native plant diversity, alter water quality, change habitat structure, and even change aquatic food webs in areas where it has become established. The Invasive Species Act has regulations prescribing invasive species and classifying them as prohibited or restricted, and parrotfeather is now on this list as a prohibited species. That means it is illegal to import, possess, deposit, release, transport, breed/grow, buy, sell, lease or trade the plant. If you suspect that an invasive plant is growing in a landscaping or water feature at your home or place of work, contact the toll-free Invading Species Hotline at 1-800-563-7711, or visit EDDMapS Ontario to report a potential sighting. Learn how to identify invasive species, especially if you are an avid gardener or landscaper, and select alternative plants from the Grow Me Instead Guide to avoid accidental invasions.